Is this wondrous rain the trees and plants need here in CA, enough? 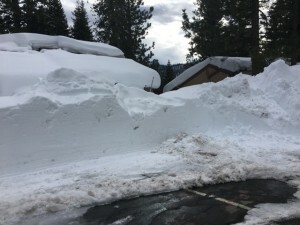 Roads are blocked here with mudslides and uprooted trees, and at China Peak/Shaver Lake where my son and wife and live and work managing 120 condos this is what it looks like. I’m blessed to live on the Central Coast where it always rains for the Pebble Beach Pro-Am; but the news says they can’t even get people to go up and work in the mountains, and my son works plowing till 3am. And his lovely pregnant wife and 2 1/2 year old daughter had no water or heat for 3 days. They barely got to the motel at China Peak. I honor them all for surviving this, and say isn’t this enough?